A 6-part telecall series that will invite you to the magic, joy, play and communion that is truly possible with bodies. Have you always known that being in a body could be an exponentially greater gift than it has been? Do you ever feel like you're missing the magic of what is truly possible with bodies? Or that you're only choosing to enjoy and create a tiny fraction of what is possible? What if your body has the capacity to heal … you, others and the earth? What can you and your body create that no one else can? What do you know about the magic of being in a body now? 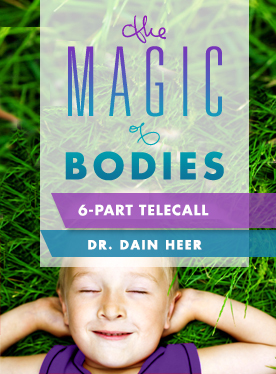 The Magic of Bodies is a new, six part telecall series with Dr. Dain Heer that will invite you to the magic, joy, play and communion that is truly possible with bodies. Recent changes in our awareness of the energetic creation of possibilities with bodies will ensure that this series takes you to a different level of possibility .... to truly creating your body from magic and as the source of magic that it was always meant to be. Is now the time? For you ... and your body?